The recommended replacement is the PIR2, Personal iButton Serial # Recorder. Records ROM ID with date and time stamp. TMEX Touch Memory File Structure. Works with ALL Dallas Semiconductor iButtons. 3Data is stored in removable DS1996 iButtons. Has Unique 64 bit registration number. No Memory Limit, just snap in another DS1996. All records are CRC-16 error checked for reliability. LED feedback of read (TMEX record update). Battery lasts for 500,000 plus reads or 5 years. Low Cost; under $100, any quantity. ESD Protection more than 27kV on both iButton ports. 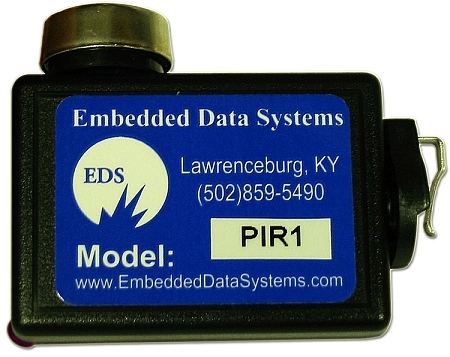 The PIR1, Personal iButton Recorder, is a low cost means of reading and storing Dallas Semiconductor iButton Unique ROM ID codes along with date and time stamp information. The data is stored in DS1996 iButtons in TMEX touch memory file format. A flash of the onboard LED indicates successful storage of the touch data and time stamp. When the DS1996 storage unit becomes full (500 readings) the onboard LED flashes 3 times to indicate the need to change to a blank DS1996. In this manner any number of readings can be collected in the field. The DS1996 is an electronic memory chip contained in a small, waterproof, stainless steel canister. Because of this unique, durable package, collected information can travel with a person or object. The steel button is rugged enough to withstand harsh outdoor environments. The onboard time of day clock is battery backed for 5 years and is easily set by inserting a DS1994 iButton in the button retainer site, and touching another iButton. The LED indicator flashes twice to indicate a successful clock set. The onboard time of day clock also has a unique 64-bit serial number that is adopted by the PIR as an identification serial number. This serial number is recorded in the header record of each DS1996 as the data entries are made. When the data is collected at the PC using a DS9097U-K with EDS "Event Logger" Software, a comma-delimited ASCII file is created with the adopted unique serial number, user comment field and the date and time of the download. The collected data contains comma-delimited records of iButton unique serial numbers and the time/date of each touch. Readings per CR2032 coin cell (1 required) 500,000 - 1,000,000 Readings. Shelf life with battery installed 5 years. Dimensions (enclosure) 1.6 W X 2.3 H X .75 D Inches. Dimensions (overall) 2.0 W X 2.6 H X .80 D Inches. Memory (DS1996) any number, one at a time 8K Bytes per DS1996. Humidity 5% to 95% non-condensing. Visual LED flashes once after successful read / write, twice after time set, and three times when iButton is full. Scan Capacity 500 button reads/DS1996, any number of DS1996 iButtons. Battery A Single CR2032 3 Volt Lithium battery provides up to 1,000,000 touches; back-up 10 year DS1996. Visual Feedback LED Flashes Once After Successful Reading And Three Times When PIR2 Is Full.